Lulu's Life: My favorite hairstyles for my Curly Hair. My favorite hairstyles for my Curly Hair. Hey guys, I’m back with another hair post! I feel like I have some knowledge I can share about having curly hair from these last almost 28 years on earth! I’ve been learning to tackle it and still have it look cute for some time now. Whenever it comes to styling my hair, I absolutely dread doing it. My hair is wavy, dry and frizzy. Over the years I’ve heard tips and tricks from many people and some things have worked, and some haven't. I have a separate blog post Here, all about how I control and tame my frizzy Italian hair. 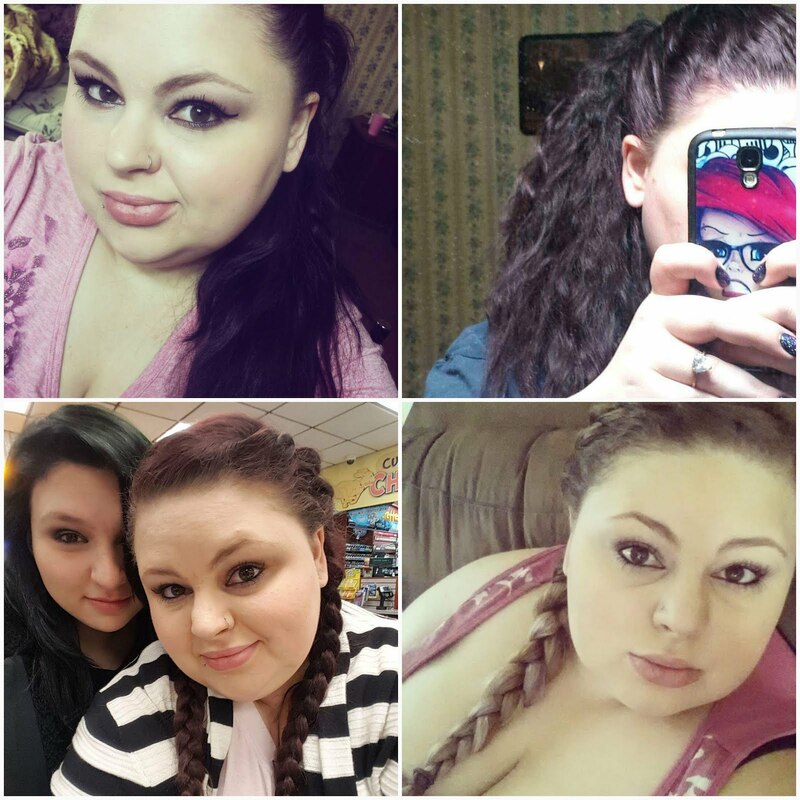 All of these pictures included, are from over the last two years. As you can see, I've been brunette, blond, I've had purple hair and an ombre. 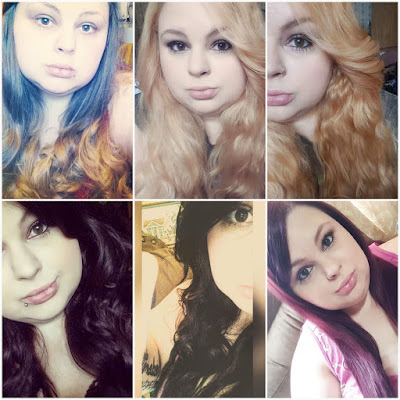 I've loved every color, it's always fun to have colourful hair. The damage is another topic, lol. I made sure to include pictures that really show my natural texture. A couple of the ways I do my hair for those days when I don’t need to look too presentable, is a pony tail, a messy bun, a tight twisted up bun or a side braid. I tend to do these a lot. If I’m spending the day at home I love a good bun so my hair is out of the way. A good side braid is my favorite go to when I have to go out and about. The only down side is I have some layers, so pieces will come out and make me itch, lol. You should know this huge thing I’ve learned, If you wear your hair up all the time, especially if it’s up tight, it will cause breakage on your hair line. I’m currently work on not putting my hair up tight. I have cause my hair a lot of breakage from having it up too tight, and of course coloring it. In the pictures I’ve added, you won’t see me in a bun. I turn into a literal egg head, it’s not cute hahaha. Sometimes I will straighten my hair if I know it’s going to be cool and I won’t be sweating. If I sweat, it’s all over for my Italian textured hair. I also may straighten some pieces along with my natural wavy texture, that gives my hair a nicer look without actually having to do much. Adding a few loose curls helps with the overall frizz, but I’m still able to embrace my natural hair. There are times I’ll do a nice sleek pony tail with the ends straightened or curled. That’s always nice if it’s hot! I don’t often get chances to dress up, so I take advantage of it and make an effort to look really nice! One style I think is really cute is when I put my hair half up and curl the ends. It has that Ariana Grande vibe that a girl just needs sometimes. I need some ideas for hair styles that will work with my hair type. I’m always open for suggestions and tips. If you have any, feel free to comment down below! I hope you enjoyed this post. If you have any ideas of future posts you would like to see, let me know down!